ATLANTA – It has been a long time and a lot of wins since Chris Hogan was a member of the Buffalo Bills. The veteran wide receiver is making his third straight Super Bowl appearance with the New England Patriots, meaning he has reached the championship game in every season since the Bills elected not to match New England's three-year, $12 million contract offer when Hogan was a restricted free agent after the 2015 season in Buffalo. "It's pretty crazy, that moment when you're like, 'Man, I'm going back to another Super Bowl,' " Hogan said. "I'm just fortunate to play on this team. To think back to where I was six or seven years ago to where I am now, I'm truly blessed to be in this situation." It was six years ago that Hogan got his first real opportunity with the Bills. While he was a star of HBO's "Hard Knocks" during training camp with the Miami Dolphins – earning the nickname "7-11" because he was always open – Hogan was quick to point out Tuesday that he still got cut there. "I was on the streets looking for a job," he said. "Buffalo gave me an opportunity, and I was able to work my way up the ranks. ... It helped me create my name in this league." Hogan said he feels like he's still the same player he was with the Bills, and the stats back that up. Over the past five years, Hogan has made between 34 and 41 catches each season, ranging in yardage from 426 to 680 and touchdowns from two to five. Like he was with the Bills, Hogan might not be a superstar, but he's a solid contributor. "Everyone knows on this team the ball's not going to go to one guy," he said. "It's going to get spread around. You just have to be ready and take advantage of the opportunities that come your way." 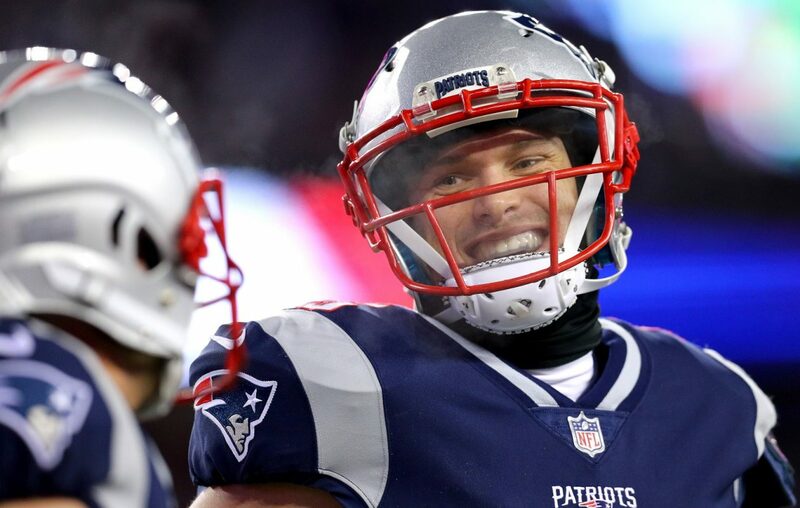 Hogan did just that in the AFC Championship Game against the Chiefs, making four catches for 45 yards – all of which came in the second half or overtime. None of the catches was bigger than when Hogan gained 11 yards on a third-and-8 play with 6:25 remaining. His spectacular, diving reception held up after a video review. Had Hogan not been able to hang on, the Patriots probably would have been forced to punt while trailing by four points. "There's been a lot of ups and downs, but we just continued to believe in one another and this team," Hogan said. "To get to this moment is pretty special. I had a couple seconds last week just to kind of think about where I've gone and where I've been. It's hard work, man. I've put in a lot of hours, a lot of dedication to try to get to where I'm at today."